During Sakura and Sasuke's first encounter in the Shippuuden series, what do you think was on Sasuke's mind when he first laid eyes on Sakura? 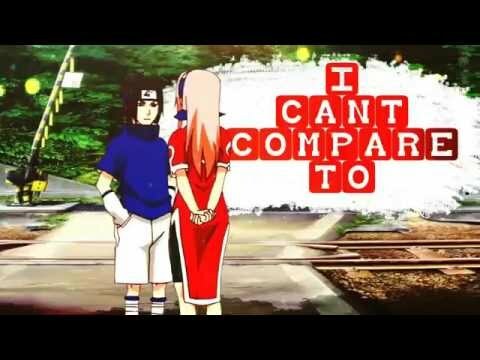 On a scale of 1 to 10, how much do you rate SasuSaku pairing? Okay,,, You guys... Please tell me you know a really nice SasuSaku fanfic involving older Sasuke and Sakura... I really those in my life right now..
She was dressed in the baby blue Chinese dress; Sasuke had gifted her last ano on their anniversary. She looked as beautiful as she had back then, even more, actually – her face had a proud and happy glow and her pink-hair was pulled back in a loose bun – so as to let her curls fall around and frame her face. Author's Note: I don't own any of the characters in the show, they've been created por Kishimoto Masashi. Also, its a work of fiction (lol) and it bears no resemblance to anything that is happening on the show for real. Also, this is my first attempt at composição literária mush, so please don't be too harsh with the review? "Aren't you a little old for action figures, Sasuke-chan?" Mikoto asked as she looked over her son's shoulder to see what he was doing. "You're almost eight now." "Pew, pew!" he said, making sounds with his mouth and waving his toys around in both hands. "You can never be too old for action figures, kaa-san. Are you tired of tou-san, yet?" Sasuke pouted. "Sometimes I hear you calling him a toy." -During the sino test, when Sakura fainted from seeing his head above ground, and the rest below, Sasuke waited for her to wake up, even though he probably knows he's wasting time. -When Sasuke and naruto were fighting Haku, Zabuza went to attack Tazuna but kakashi protected him and Sakura screamed. When she did, you could hear worry in Sasuke's voice when they heard her. a poll foi adicionado: Should I add my own SasuSaku video here?